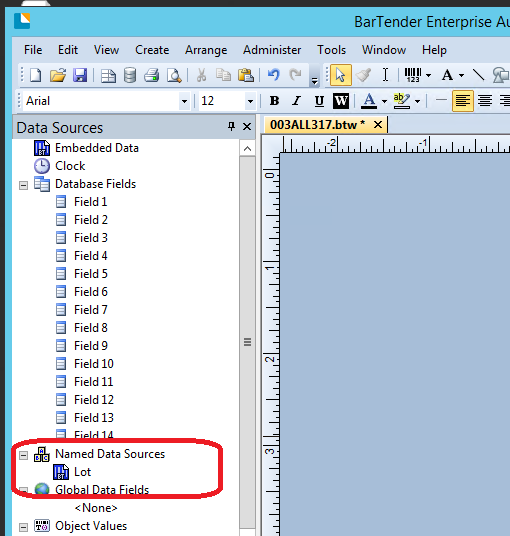 This Error Message Article explains the BarTender error message “Not enough digits for GTN-14” and details how to fix the underlying problem that caused it to appear. This error is caused by a VB Script in the label file (the symbol in front of the message indicates that it is a message from VB Script). Initial assessment of this issue will lead to a conclusion that it is a message generated from a custom VB Script code in the Lot variable under Named Data Source. However, you do not remember ever create this particular variable. The source of Lot variable is unknown. However, we speculate that it is a result of BarTender wizard use for generating some bar code format. Delete the Lot variable would resolve the problem.